Restorative procedures are accompanied by a reduction of tooth stability, a decrease of fracture resistance, and an increase in deflection of weakened cusps. The choice between a direct or an indirect restorative technique, mainly in posterior areas, is a challenge, and involves biomechanical, anatomical, functional, esthetic, and financial considerations. In this article, the pros and cons of direct restorations are examined, as well as an analysis of indirect restorations and an overview of dental ceramics. In particular, several clinical uses of lithium disilicate overlays with a circumferential adhesive ferrule effect are proposed: heavily compromised vital teeth with thin walls, cracked teeth, and endodontically treated molars. Clinical procedures are described step by step on the basis of data from scientific literature. In conclusion, the use of lithium disilicate in combination with adhesive technologies can lead to a more conservative, economic, and esthetic approach in the restoration of heavily compromised teeth. A full-mouth rehabilitation should be correctly planned from the start by using a diagnostic wax-up to reduce the potential for remakes, increased chair time, and laboratory costs. However, determining the clinical validity of an extensive wax-up can be complicated for clinicians who lack the experience of full-mouth rehabilitations. The three-step technique is a simplified approach that has been developed to facilitate the clinician's task. By following this technique, the diagnostic wax-up is progressively developed to the final outcome through the interaction between patient, clinician, and laboratory technician. This article provides guidelines aimed at helping clinicians and laboratory technicians to become more proactive in the treatment planning of full-mouth rehabilitations, by starting from the three major parameters of incisal edge position, occlusal plane position, and the vertical dimension of occlusion. Although resin-bonded fixed dental prostheses (RBFDPs) were developed almost 40 years ago, their implementation in clinical practice did not achieve success due to biomechanical failures of the restorative materials. Nowadays, the evolution of ceramic materials and bonding procedures has allowed for the revival of the dental prosthesis. Zirconia is the dental ceramic with the highest flexural strength under compression. However, there are still some concerns regarding the bonding strength of zirconia to enamel that require further research. In this article, through the presentation of three clinical cases, the authors show how modifying the surface of zirconia frameworks by applying a feldspathic veneering on the retainer's buccal surface allows for a bonding procedure to dental structures. The goal of this treatment method is to simultaneously improve structural strength, esthetic integration, and bonding optimization to enamel. In a 3-year prospective evaluation, this framework modification shows promising results, with a survival rate of 100% and no biological or mechanical complications. Objective: The optical integration (OI) of monolithic CAD/CAM materials under 4 illuminations was evaluated using a standardized and clinically relevant method. Materials and methods: Eighteen inlays were manufactured and placed (glycerin gel). Standardized photos were taken under 4 illuminations (neutral white light direct and indirect illumination, cross-polarized light, fluorescent light). Six evaluators defined the optical integration score (OIS) as the "visibility" of the restoration (0 = worst OI, 4 = optimal OI). The intact tooth served as control. The null hypothesis was that different illuminations did not influence the OI of CAD/CAM inlays. One-way ANOVA, followed by Scheffe's post hoc, was applied (P = 0.05). Results: Neutral light direct illumination: OIS between 2.67 (IPS e.max CAD LT A1, ENAMIC A1) and 3.83 (IPS e.max CAD HT A1) with a mean of 3.28 (± 0.339). Indirect illumination: OIS from 1.00 (Paradigm MZ100 A1) to 2.41 (ENAMIC A1) with a mean of 1.88 (± 0.598). Fluorescent light: OIS between 0.75 and 3.25 with a mean of 1.67 (± 1.025). ENAMIC and VITA BLOCS Mark II showed the best optical integration in fluorescence. IPS e.max CAD, Paradigm MZ 100 demonstrated low fluorescence; Lava Ultimate high fluorescence. OI was influenced by different illumination. Conclusion: A simple method accessible to clinicians for additional evaluation of CAD/CAM materials in daily practice is presented. All materials showed excellent OI under direct illumination with neutral white light. The most pronounced differences in optical integration between tooth and evaluated materials were observed under fluorescent light. Both hard and soft tissue undergo change after tooth extraction. In particular, the bone tissue surrounding teeth with fenestration or dehiscence defects undergoes dramatic change following tooth extraction, which can compromise further rehabilitation of the area. Adequate alveolar bone volume and keratinized mucosa are critical to the success of implant therapy. Therefore, the anatomic dimension of the alveolar ridge must be adequate to achieve an esthetically acceptable outcome of implant therapy. Previous studies have proposed many clinical techniques for preserving the extraction socket. 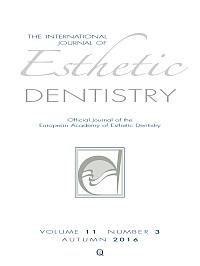 This article presents a procedure in which an open collagen membrane technique was adopted to maintain an adequate volume of hard tissue and a sufficient width of the keratinized mucosa for further esthetic and functional implantation. Through this simple technique, an adequate volume and architecture around the implant can be achieved, with a long-term prognosis for implant therapy expected. Objective: The aim of this study was to assess the dental bleaching efficacy of 37.5% hydrogen peroxide (HP), with and without light activation, in HP-exposed and unexposed areas. Method: 28 bovine teeth were selected and divided into two groups (n = 14). Crowns were detached and stained with tea. The gingival half was covered with a gingival barrier. In the incisal half, 37.5% HP (Pola Office+, SDI) was applied three times, with a 1-week interval between applications. In HP-A group, the bleaching agent was activated for 3 min with a LED lamp. No light activation was applied in HP-N group. Dental color variation was determined through a spectrophotometer in both halves. Statistical analysis between groups was performed with an ANOVA test, and intragroup differences were evaluated, with an ANOVA test for paired data, with a significance level of P < 0.05. Results: An increase in lightness and a decrease in chroma were found in both groups and halves. No significant differences in ΔE between groups (P > 0.5) were detected in the incisal half. After treatment, a significantly higher ΔE was found in the gingival half for HP-A group (P < 0.05). For the same group, a significantly higher bleaching effect was found in the gingival half, compared with the incisal half (P < 0.05). Conclusions: LED activation did not have a significant effect in terms of bleaching in the incisal half, but increased clearance in the gingival half. Clinical relevance: HP light activation does not significantly increase the whitening effect, but it can improve the bleaching diffusion to areas where it has not been directly applied.